We know that Ubarians are proud of their membership. In many cases, they want to show it off by wearing shirts and other personal items that show their affiliation. While we hope they don’t wear this while enjoying hi-jinks, hullabullo, or other tom-follery, we encourage our Prophets to proclaim how proud they are to be members. In keeping with this idea, Ubar Grotto is proud to announce the development of an official Ubar Pocket Greeter. I mean, really… any Masonic group worth its salt has an official name badge, so what makes Ubar’s different? Rather than being cheap plastic and plainly colored, the Ubar pocket greeter is made of metal to resist all accidental falls or injuries. Furthermore, the logo is created in full color and sublimated onto the metal, preventing it from wearing away. The Ubar name tag will put all other Masonic name tags to shame. The Ubar name tag will fight any other Masonic name tag in a no-holds-barred cage match. The Ubar name tag will throw other Masonic name tags into the fires of Mt. Doom, where they will melted like the tawdry pieces of garbage they are. 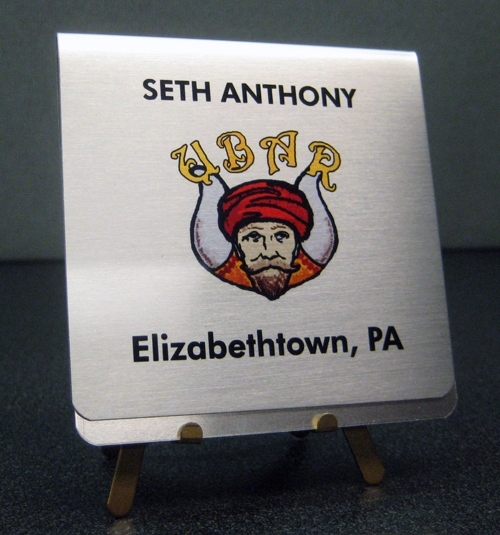 If you’re ready to Order your own Ubar name tag, then grab the Ubar Grotto Name Tag Order Form (also available in the Other Resources section.) Forms are due by the meeting in October, so make sure you get yours in today! ← Well, I didn’t vote for him!